Join the discussion on our forums! Come discuss Shimmerfly over in our dedicated Shimmerfly discussion topic. I love this card: good turn 1 drop, activates Headhunter's Hatchet or Scavenging Hyena on turn 2 and refills your hand too (with some exceptions, Hunter's spells are very good). It's not over: with the Beast tag, it can be targeted by Dire Frenzy (not the best target, ok: Springpaw is superior, but still...) and has synergy with Tundra Rhino and Master's Call. Not bad for just a 1 mana flappy boy! Pretty good in beast or midrange hunter. It’s also a beast which is great. 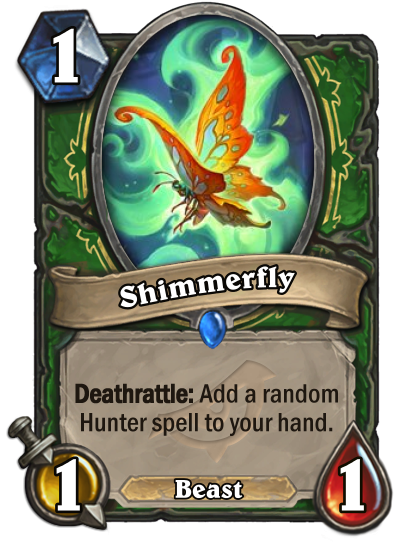 Hey, that's a pretty nice spell generator for Hunter. I will probably replace a Webspinner with it. It is really nice to get another cheep card that generate resources. Webspinner used to be great, so this should be great too. Without additional value hunter gravitates towards aggro and I don't like to play aggro hunter.